“I cannot remember telling my parents that I was studying Classics,” J.K. Rowling said in a 2011 commencement speech at Harvard. “They might well have found out for the first time on graduation day.” Before this future novelist arrived at the University of Exeter in 1983, Rowling’s mother and father had dissuaded her from focusing on English literature. Eventually, she agreed to set her sights on modern languages instead. In the end, Rowling studied French, which she’s since called “a mistake.” But her chosen minor would pay off big-time. As a Classics student, Rowling’s coursework later helped flesh out Harry Potter’s magical world, for at Hogwarts, the tongue of ancient Rome is alive and well. 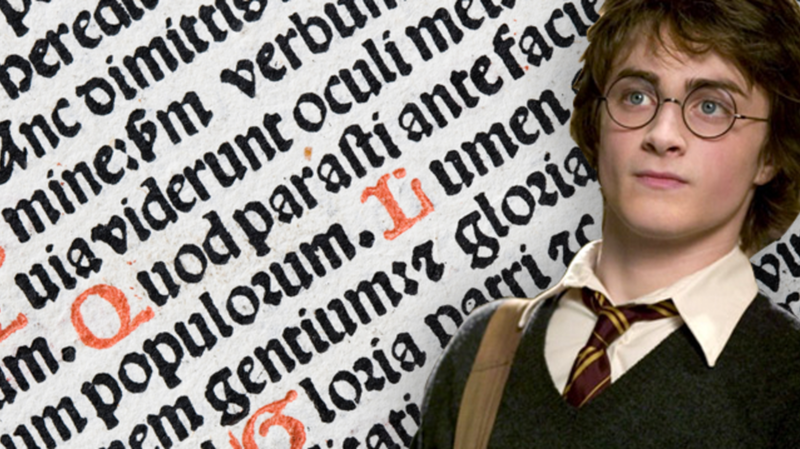 Every other page in the series is loaded with Latin—here are some of our favorite nods. Case in point: Expecto patronum means “I await a patron.” In classical Rome, a “patronus” was a rich citizen who would pay and offer legal protection to some of his poorer associates who’d show their gratitude by providing various services—an awfully far cry from those animal-shaped, dementor-fighting guardians Rowling came up with. Here’s a disappearing spell—which Neville Longbottom casts on his own desk—that literally means “to vanish.” Sounds about right. When you’ve gotten this one down pat, disarming an opponent becomes child’s play. The incantation loosely combines expellere (“drive out” or “expel”) and arma (“weapon”). Whispering the Latin word for “night” is basically the astute young wizard’s answer to those trendy “clap-off” lamps—it extinguishes the glow at the end of your wand. Severus is how Latin-speakers say “severe” or “serious.” That about sums up Snape’s chilly personality. No wonder this guy got himself bitten by a werewolf! With a name like Lupin, Harry’s third Defense Against the Dark Arts professor had it coming—after all, not only does lupus mean “wolf,” but the extant gray wolf is scientifically known as Canis lupus. While it isn’t exactly “hidden,” this deserves a quick mention. Like a number of real schools and universities, Hogwarts pours on the prestige with a Latin slogan: Draco Dormiens Numquam Titillandus or “Never Tickle a Sleeping Dragon.” Eat your heart out, Yale.